The jazz piano trio and Jamaican dub musicthe reggae sub-genre that focuses on slowing down the original reggae mix and emphasizing the bass and drums tracks with studio wizardryseem to be two distant musical universes. Yet producer and multi-instrumentalist Jamie Saft's New Zion Trio debut recording succeeds in blowing fresh winds in the traditional piano trio with dub aesthetics, citing King Tubby, Bob Marley, Bill Evans, Pharoah Sanders and Alice Coltrane as influences. All the compositions, except the closing "Fire Ablaze," were recorded live without any overdubs or studio-enhanced manipulations, but still follow in the Jamaican dub footsteps in their unhurried meditative pulse. Saft's piano and Fender Rhodes chime, while double-bassist Larry Grenadier and drummer Craig Santiago emphasize the trance-like pulse slowly and methodically, as if every note counts. 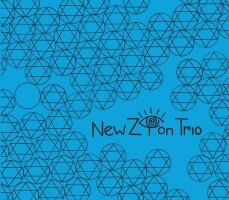 New Zion Trio's articulation of the themes is quite different from the typical piano jazz trio as it is not about exploring complicated harmonic possibilities or chord changes, or developing ever-changing roles amongst the trio. This group clearly does not subscribe to any usual model of the piano trio, nor does it make any attempt to swing. "The Red Dies," one of the compositions that features a clear reggae drumming style, demonstrates this trio's artistic path. All its members surround the meditative pulse, with the walking bass, the drumming and the piano's harmonic development pushing while still allowing plenty of room to fully absorb and surrender to the the addictive pulse. "Hear I Jah" floats around Saft's chiming Rhodes, while Grenadier and Santiago cement the theme in a light reggae-tinged pulse. Grenadier shares the lead with Saft on "Gates" and "Ishense," with his rich sounding bass, while "Fire Ablaze" sounds like a minimalist piece with its gentle, repetitive sound. The digital version of this beautiful album adds a bonus dub remix of "Hear I Jah" from Dubmaster Christian Castagno called "Inna Sade Dub, intensifying the positive vibrations message of the promising New Zion Trio. Track Listing: Slow Down Furry Dub; Niceness; The Red Dies; Gates; Hear I Jah; Ishense; Losr Dub; Fire Ablaze; Ina Sade Dub (Christian Castagno Dub). Personnel: Jamie Saft: piano, Fender Rhodes; Larry Grenadier: double-bass; Craig Santiago: drums.